Few herbs are easier to grow than basil (Ocimum basilicum), as long as you live in a warm climate. Basil is a tender annual that's quite sensitive to cold temperatures, which slow its growth and can increase its susceptibility to disease. To ensure a good crop of aromatic leaves, it's important to wait to plant the basil until temperatures warm where you live and to protect a garden plant if you expect unusually cold temperatures. Basil has dark green, shiny leaves. Basil plants are sensitive to frost, and any prolonged exposure to subfreezing temperature can kill the plant. But even temperatures below 50 degrees Fahrenheit can stunt the plant's growth and might damage leaves. It's best to start basil plants indoors about three or four weeks before your last expected frost date, waiting until soil warms to 60 degrees and the air stays above 50 degrees to plant basil seedlings in the garden. About a week or two before your planting date, put basil seedlings outdoors for some time each day, keeping them in a partially shaded, sheltered spot and gradually increasing their outdoor time. This period of acclimation prepares seedlings to move outdoors full-time is called "hardening off." You can also start with seedlings purchased from a nursery. Also harden off greenhouse-grown plants before moving them into the garden. If you expect a period of unusual spring cold after your basil plants are in the ground, you can take some steps to help prevent damage. Water the plants thoroughly, because wet soil tends to stay warm longer than dry soil. You can also cover them with a lightweight sheet of plastic or a row cover. Use stakes to keep the covering off the leaves, and anchor its edges to the ground with earth staples; remove the covering during the day when temperatures rise. If cold temperatures damage the basil leaves, you might see black edges, or entire leaves might shrivel and blacken. If this happens, trim away the damaged leaves with shears, wiping the blades with rubbing alcohol between cuts to prevent disease spread. If only a few leaves are damaged and stems remain strong, the plant should recover. When fall's cool weather arrives, you can keep a basil plant growing longer by protecting it from early frost. Water the plant before a freeze is expected, because moist soil absorbs more heat from the sun. You can also use plastic sheeting or row covers to cover the plants, but ensure the cover is well-separated from the plant's foliage to reduce radiant heat loss. Mulching the plant's roots and covering the top of the plant with loose straw can also protect it from cold damage, but remove the material from the plant's upper parts during warm, sunny days. If you're growing basil in pots outdoors, move the potted plants to a protected location when a cold spell threatens -- near a warm building wall or on a covered porch -- until warmth returns. 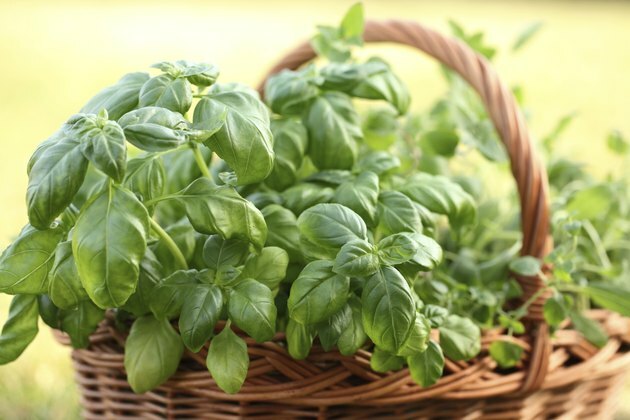 When winter approaches, you can dig up basil plants to overwinter them indoors. Choose plants with green and healthy-looking stems and leaves. Leave behind any plants heavily damaged by frost; these have shriveled or blackened leaves, or drooping stems. If a plant has a few damaged leaves but the remainder is healthy, trim off the damaged parts and bring it indoors. Put the plants in clean pots, adding potting soil as needed, and keep them indoors in a sunny, south- or west-facing window; water sparingly, letting the top inch or two of soil dry between waterings. Although basil plants grow slowly in the winter, they can remain healthy and green, and some plants may survive to move back outdoors in spring. Does Creeping Phlox Need Frost Protection? 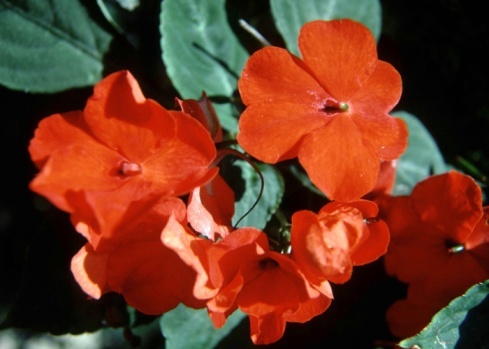 How Cold Can Impatiens Get? What Causes Yellow Leaves on Passionflower Plants?